GLENDALE, Ariz. — Andre Burakovsky made a mistake that led to Arizona's first goal and spent most of the night watching pucks repeatedly bounce over his stick. When given a late opportunity, though, he halted the Coyotes' four-game winning streak. 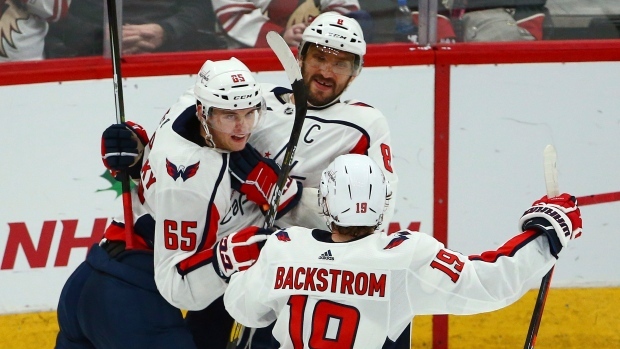 Promoted to the top line due to Tom Wilson's injury, Burakovsky made up for his early miscues by scoring late in the third period and lifting the Washington Capitals to a 4-2 victory Thursday. "This game is funny," Burakovsky said. "You're playing good, some nights have 1,000 chances and can't score, and some nights you're struggling hard and get one." Coming off consecutive losses, the Capitals faced one-goal deficits in each of the opening two periods. Jakub Vrana scored his third goal in two games in the first period and Matt Niskanen had one on his birthday in the second. Pheonix Copley turned away numerous good chances while making 27 saves, and Burakovsky scored the winner with 4:42 left on a shot that caromed off goalie Adin Hill's blocker. Alex Ovechkin added an empty-net goal after becoming the fastest player — ninth overall — to have 5,000 career shots, reaching the mark in 1,031 career games. Marcel Dionne was the previous fastest at 1,215 games. "We've been creating chances every game, playing good games, so it's good to see it pay off," Vrana said. Christian Fischer scored in the first period, but the Coyotes missed on several opportunities to stretch the lead. Lawson Crouse scored in the second and Arizona again wasted some decent chances in the third before Burakovsky scored. Hill stopped 26 shots, giving up one more goal than he had while opening his Coyotes career with four straight wins. "They made the play, we didn't," Arizona coach Rick Tocchet. "We had our chances." The Coyotes jumped on Washington early when Fischer, who earlier limped off after blocking a shot, one-timed a pass from Derek Stepan from the right circle. Arizona squandered a chance early in the second period when Richard Panik missed the net on a penalty shot. The Capitals ratcheted up the pressure from there, tying it on Vrana's wrist shot from between the circles that beat Hill to the glove side. Crouse tied it 90 seconds later, gathering a loose puck between the circles, sliding to his left and beating Copley to the stick side. Niskanen tied it late in the period on a shot that caromed off Arizona defenceman Jacob Chychrun past Hill. The Capitals got their turn for a penalty shot next and also failed when Vrana couldn't find an opening against Hill. Burakovsky, after struggling most of the night, scored the winner on a shot Hill saw, but couldn't stop. "I got a piece of that shot with my blocker, but I've got to make that save," he said. NOTES: Wilson did not play due to a concussion sustained Tuesday against Vegas. ... Arizona lost for the third time in 15 games (11-3-1) when scoring first. ... Niskanen turned 32. ... Coyotes C Vinnie Hinostroza went out in the first period with a lower-body injury and did not return. The Capitals play at Columbus on Saturday. The Coyotes host the San Jose Sharks on Saturday.